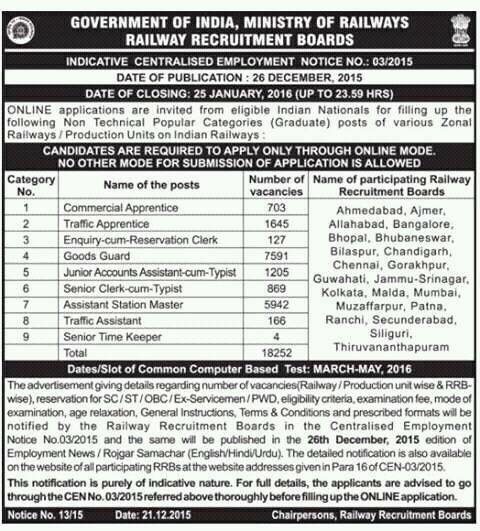 Railway Recruitment Board has notify 18252 Vacancies for its various vacant posts. More than Million people from all across the country will be participating in RRB 2016 Recruitment. Candidates who wants to make their career in Indian Railway can apply for Indian Railway Recruitment 2016 for which you will have to apply only online. No other mode of application will be entertained by the Railways Recruitment Board. Many of the candidates are going to apply online for the first time and because of this they are facing so many problems while applying for the Indian Railway RRB Recruitment 2016. Such as some candidates have official notification related issue, Some candidates wants to know that if a candidate can apply for two posts in RRB Recruitment 2015? (Kya ek student do posts ke liye apply kar sakta hai? ), Some candidates are having payment related issue such as Website of RRB is sometimes not displaying the payment page? , Some candidates are not getting confirmation after payment? and more more issue like age or reservation related issues. So here i am going to share all the solution related to these genuine problems accuring while applying online for RRB Recruitment 2016. The very option for you is to open the website in Internet explorer as it is the most suitable browser to use Websites related to Indian Govt. Yes, A candidate can apply for more than a post but,if exam dates clashes than RRB will not be responsible. What is maximum Age limit for RRB Recruitment?? RRB has decided different age limits for different posts. Thus read the official notification very carefully. What to do? If payment option is not displaying on RRB’s Website? or not able to get receipt after making payment? If you made the payment for the post you have applied in RRB and not able to generate receipt than you should contact RRB’s on their Student Care No/ or RRB Contact No which is available on all the working days. Here i am Sharing RRB Helpline no with you. After all these question, if you have any other problem or question related to RRB Online application submission than you can ask it to us in our comment box. We would love to answer your query. i have not geeting confirmation after payment of RRB and i have change my exam center..
please help me as soon as possible.sir i call many times this number-011 2338 7529 but no one recive my call ..